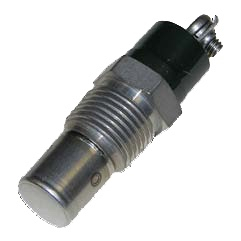 The Airpax™ 5020 series is a single throw, snap-action, hermetically sealed temperature control designed for applications requiring high vibrational resistance. The snap-action disc is located in the very tip of the probe,assuring rapid and true response to temperature. The welded construction (and grounded case) of this sealed thermostat ensures meeting thermal shock specifications of MIL-STD-202, method 107, test condition B. In addition,the tube will withstand a pressure exposure limit of 1500 PSI. Typical applications include hydraulic systems, degreasers, industrial and portable compressors, refrigeration systems, generator sets, chemical baths, engine coolant, oil and transmission protection.